Hawkins, Moore & Cubbedge, a firm of Certified Public Accountants and Advisors, has a long lasting reputation in Marietta and Cobb County for providing sound, expert advice for some of the most well-known business owners and government figures. The problem: Like many consulting, law, and CPA firms, the partners’ last names are used in the company name, making it difficult to spell and even more difficult to remember. Regardless of their reputation, Hawkins, Moore & Cubbedge was facing a branding challenge that could hurt business. id8’s goal was to help the brand become more memorable without losing the firm’s identity or its equity, since it already had a strong positive reputation. The id8 team developed a new logo with strong colors (blue and gold) and a design that married the firm’s full name more closely with the acronym also used by the firm—HMC. This design not only maintains the prestige, reputation, and dedication of the partners, but it also helps help clients and the public more easily recall HMC. With the new logo in place, the next step was to update the firm’s corporate identity, which did not reflect the high-end value and sophistication brought to the table by HMC. To elevate the business card, letterhead and envelopes, the design included a gold, repeating diamond pattern placed subtly in the background and on the backside of the materials. This simple, yet sophisticated pattern represents the thoroughness and precision of the firm’s work due to their systematic approach. These details also convey to clients that, as with their marketing materials, HMC take the time to analyze and research every detail to ensure they are providing the best possible advice. 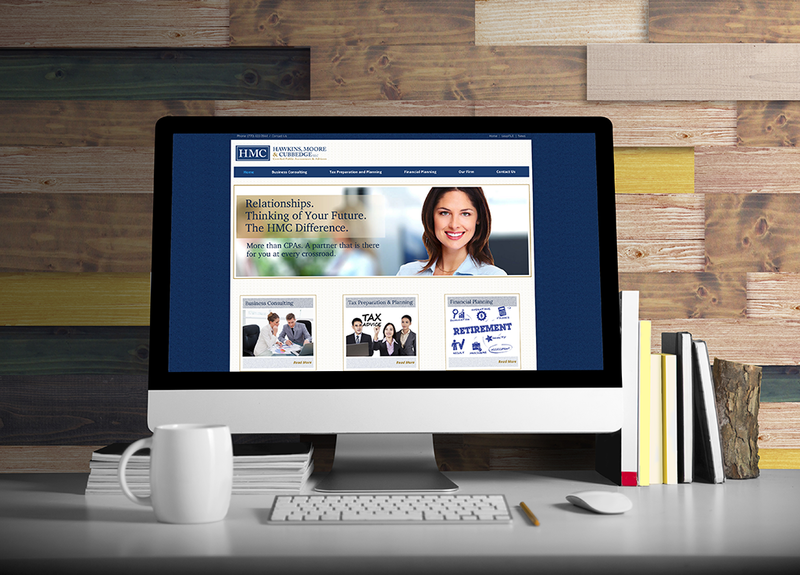 Today, the HMC brand is strongly represented across the firm—from their logo to their corporate identity and website. Messages are consistent throughout, and the firm is now confident about sending clients and prospects to their website, which is easy to use and accurately reflects the firm and helps them market their services and unique differentiators. Thank you for looking over all of our collateral material and making suggestions … We appreciated your concern for our costs and the thorough job you did … We look forward to working with you to improve all of our materials on an ongoing basis.